Mar 07, 2017: Tips on how to get my five-year-old son to stop biting and sucking his fingers and nails. Feb 02, 2018: How can I stop habitually biting/chewing my fingernails for good? 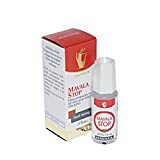 Mar 16, 2018: "Mavala Stop Nail Biting" is a must have! Apr 21, 2019: LPT: Looking for tips to stop bad nail biting habit.